For some reason, I seem to have a soft spot for any Blue Jays apparel. Second to only my beloved Philadelphia Phillies, I have more Blue Jays caps than anything else. However, this is my first cap of the blue and silver logo used from 2004-2011. Specifically, this gray cap was worn exclusively from 2004 to 2005, before being replaced with a more traditional black cap with a silver “T” (pictured below). 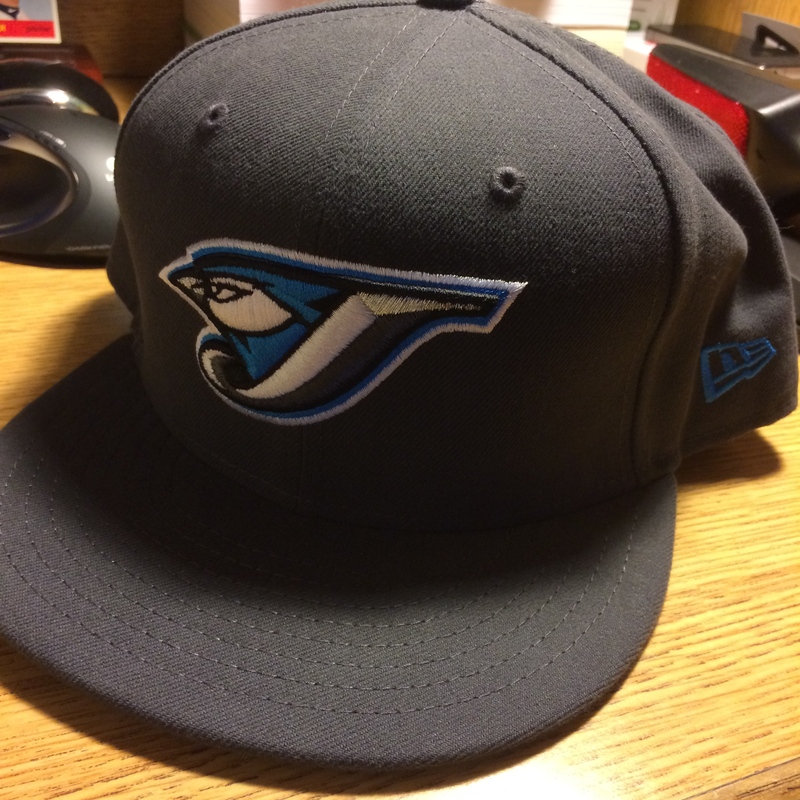 Some great Blue Jays players had the honor of wearing this elusive cap, including All-Stars Ted Lilly, Carlos Delgado and Shea Hillenbrand, as well as two-time Gold Glove Vernon Wells. * But to me, this cap was worn by arguably the greatest pitcher in Blue Jays’ history: Roy “Doc” Halladay. I can’t imagine there will ever be a point in my life when the Blue Jays are not synonymous with Roy Halladay. In his 11 year career with the team, he was a six-time All-Star, a Cy Young winner, and an AL Wins Champion. He also has numerous team records, highlighted by the most wins in a season with 22 during 2003. I remember visiting Toronto as a kid (which you can read more about here), and in a city where baseball takes a backseat to hockey, Roy Halladay still managed to be a hero. Whenever he was pitching, attendance at the Rodger Center soared. His jersey was among the top selling for most of his tenure, which is impressive for a smaller market team such as Toronto. But for all of his accomplishments with the team there were two things that alluded him: a no hitter and postseason play. In 2010, Halladay was traded to my beloved Philadelphia Phillies for Travis d’Arnaud, Kyle Drabek and Michael Taylor, and agreed to a 3 year contract extension with a fourth year vesting option. With the addition of Roy Halladay, the Phillies were supposed to have the last piece of their puzzle to win the World Series for the second time in three years. Even though Cliff Lee was fantastic for for the Phillies in 2009 (winning both of his starts in the World Series), Halladay was seen as an upgrade due to his “potential future Hall of Famer” status, and Lee was traded to the Mariners the same day. In my lifetime, I cannot remember a pitcher as dominant as Halladay was in 2010. Granted, being a Phillies fan I am at least a little biased, but the stats do not lie. I don’t remember then-Phillies pitcher Kevin Millwood’s no hitter back in 2003, so when Halladay threw a perfect game against the Florida Marlins it was a miracle. He was everything we as a fanbase expected him to be and more. He even gave us the endless shirts with “Doc-tober” emblazoned upon them. By this time, Halladay had the Cy Young locked up with 21 wins, but Doc still had something special left to show us. On October 6, 2010, in his very first postseason appearance, Halladay pitched the second postseason no hitter of all time against the Cincinnati Reds. It was truly icing on the cake to one of the best seasons by any pitcher of all time. ** Despite finishing the postseason with 2 wins and 2.45 ERA, Halladay and the Phillies sadly fell short of their World Series aspirations. His 2011 season was almost equally impressive with an even lower ERA of 2.35, and finished second in the Cy Young voting behind Clayton Kershaw. But injuries cut Halladay’s career short, and he has since retired a Blue Jay. Tragically, he never got his World Series that he truly deserved. There is much more to say about his last two injury plagued seasons with the Phillies, and the debate of whether he is a Hall of Famer is something that deserves its own article(and will get it), but for now I just want to remember Doc as the greatest pitcher throughout my childhood and for one of my favorite quotes in baseball when referring to his first ever playoff appearance. I want to give a special thank you to my friend Benjamin Christensen, who out of the pure kindness of his heart sent me this cap, knowing I had been looking for it for quite some time. It seemed the basically the entirety of the Internet was sold out; I couldn’t even find one on eBay willing to pay just about any price. When I asked Ben if he knew anywhere I could find one, and much to my surprise he told me exactly where I could find it, knowing for a fact he had one in my size sitting in his mother’s closet all the way back in Portland. To me, Ben is a king on the internet, specializing in all things baseball, beards and New Era Cap related, and his opinion is second to none on the subjects, even participating in the MLB Fan Cave as a representative of the Oakland A’s. He has all my thanks, for without him this article would not be possible. I highly recommend both following him on twitter (@Shakabrodie) as well as reading his blog (www.hatsandtats.blogspot.com). This cap meant a lot to me buddy, and I cannot thank you enough. *These individual player awards only account for the two seasons this cap was worn. This entry was posted in New Era Caps and tagged American League, Blue Jays, Canada, New Era Cap, New York Mets, Philadelphia Phillies, Roy Halladay, Shakabrodie. Bookmark the permalink. Not sure what's better matching*: us or our flags 🇮🇹🇲🇽 . . . . . . *The matching was completely unplanned; literally that is the one day I decided to wear something other than work clothes.